← Look what’s trending at Martin Pierce…. Here at Martin Pierce we believe that a beautifully decorated bedroom that provides a good night’s rest should not be considered a luxury. The most important piece in the bedroom is, of course, the bed and, as we mentioned in our recent post on what is trending at Martin Pierce Custom Hardware, orders for our custom bed designs are up. In our previous post we shared our beautiful and exotic Rickshaw bed that offers a zen like quality to the bedroom in a sophisticated residence or boutique hotel. The look of our Hedgerow bed is quite different but also experiencing current popularity. 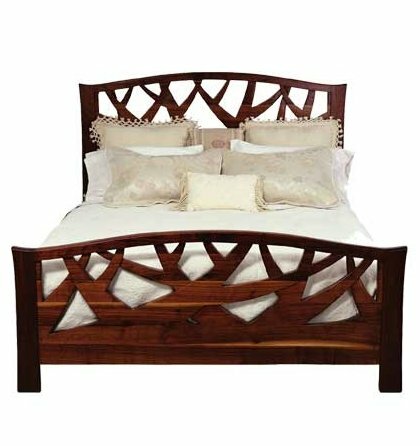 This impressive bed is crafted from American grown walnut, a wood with a beautiful grain and color. The bespoke features include a hand-carved footboard and headboard while a hand-chiseled “chip” carving detail on the posts provides additional texture to the overall organic style of this bed. Two of these magnificent beds are finding new homes in the McNamara & Hirschman showroom located in the Arizona Design Center. Since opening their doors in 1989, the name Mcnamara & Hirschman has become synonymous with quality and style and is the go-to spot for designers with a discriminating clientele. This entry was posted in custom furniture, Uncategorized and tagged custom furniture, hand carved bed, mcnamara & hirschman, walnut beds. Bookmark the permalink.